The backbone of the UK’s retail industry is it’s distribution, transport and logistics infrastructure. The huge distribution centres we see dotted across the country are hives of activity; storing, sorting and distributing goods with absolute military precision. 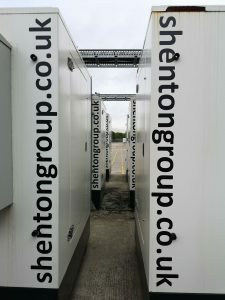 The potential of power outages is, of course, unthinkable and like one of shentongroup’s large retail clients in Doncaster, a robust Standby Power solution must be in place in the event of mains power failure. Having been approached by our client, whose share of the UK’s clothing and homeware market goes from strength-to-strength each year, their distribution centre serving a large number of national stores must be fully-operational 24-7. Having provided the client with 10 x 550kVA diesel generators three years ago, we recently undertook a courtesy visit to ensure that our client is happy with how their solution is supporting business continuity. 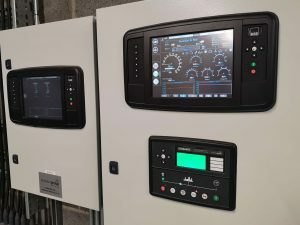 As well as the ample array of 10 diesel generators that support the client’s distribution centre and supporting data centre, shentongroup also provided at the time state-of-the-art Deepsea Controllers (DSE8004, 2 x 8610, 10 x 8610 controllers on the set). We also undertook short term synchronisation with the mains to ensure a no-break return of power. The project was of such a technical interest that Deepsea Electronics themselves attended the site to look at how shentongroup had arranged their equipment models and also engaged with us on the Factory Acceptance Test prior to delivery to the client. With the client now at the height of its annual trading, their team can rest assured that their main distribution centre and supporting data centre will not falter should there be any compromise to mains power supplies. If you’d like to learn more about shentongroup’s diesel generator solutions, click here to speak to a member of the UK’s leading technical experts in Standby Power, Uninterruptible Power Supplies and Combined Heat & Power Systems.